First manufactured in 1997 and introduced worldwide in 2000, the Toyota Prius was a car that appealed to a distinct subset of consumers: green-minded folks open to new car technology who put value on fuel economy and reliability. Once a dowdy little subcompact with a stubby nose and an under bite, the Prius has evolved into something you probably didn’t see coming. That is unless you pay attention to foreign car markets. Four years after being released in Toyota’s home country of Japan, an all-wheel-drive Prius is finally hitting the U.S. this month. 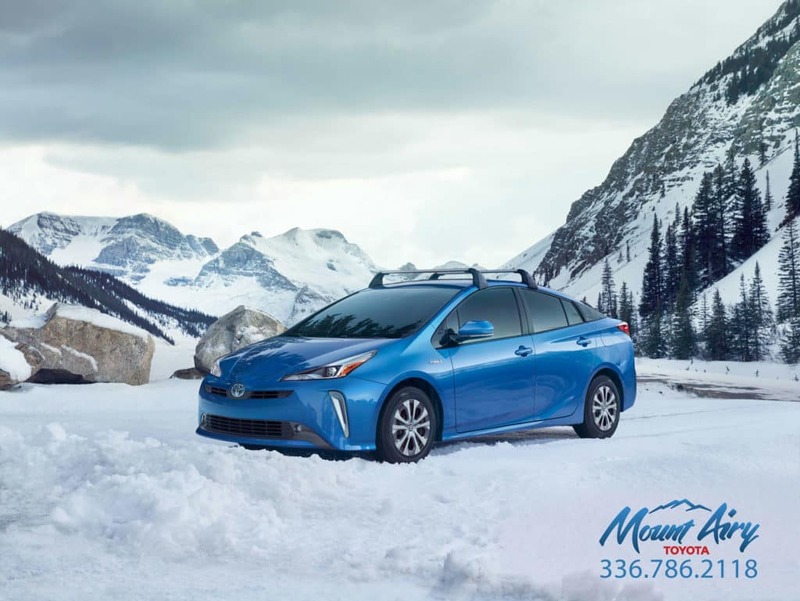 The 2019 Prius AWD-e comes as one of the most fuel-efficient all-wheel-drive-equipped passenger cars available with estimates of 52 miles-per-gallon city / 48 miles per-gallon-highway / 50 mpg combined. To give me an idea of how the AWD-e system works, Toyota set up a small handling course in Kohler, Wisconsin, consisting of a 6 percent grade and a chicane, both of which were covered in fresh snow. There’s no drama as the 2019 Prius stops halfway up the grade and accelerates from a standstill — moderate throttle application is met with the whir of the electric motor doing its business, and that’s it. No muss, no fuss. On the chicane, however, the AWD Prius feels pretty darn lively. Not knowing when the system will activate the rear motor means the tuchus wiggles arrive suddenly, but not in a way that makes the car feel unstable or anything. It’s just a little excitable, and judicious throttle application can, in fact, get a little bit of a drift going on. I’ll even go so far as to say it feels fun in the snow. By comparison, the front-wheel-drive Prius feels a little more stable on the chicane. Having all the power go through the front wheels means that the rears will just follow suit all day long, with no ability to move under their own power. I wasn’t allowed to take the FWD Prius up the 6 percent grade for comparison, and while I feel confident that a running start will get the car up a hill like this just fine, it’s definitely easier to tackle in the AWD variant. On the roads in Sheboygan and Kohler, both Prius variants feel nearly the same. On cold, dry roads, the extra boost from the rear motor doesn’t change how the vehicle acts when accelerating from a stop — and again, it never engages over 43 mph, so both cars drive exactly the same at highway speeds. It’s not a system that’s supposed to be felt at all times, so in that sense, it works exactly as Toyota’s engineers intended, offering extra peace of mind but only when necessary. Toyota’s press release for the 2019 Prius AWD-e doesn’t use the word horsepower even once. Instead they mention the car’s “ultra-low 0.24 coefficient of drag,” “electronically controlled planetary-type continuously variable transmission,” and “ultra-low internal friction and efficient combustion” that “exceeds 40 percent thermal efficiency, which is among the highest in the world for a gasoline engine.” This is the kind of talk you won’t hear about Ram trucks or GMC SUVs. The 2019 Prius AWD-e is redesigned with a new consumer in mind: the active adult who wants a bit of cool factor with their hybrid car. The AWD-e will offer available Genuine Toyota Accessory cargo crossbars for roof rack attachments. Think carrying bikes, kayaks, snowboards, or a cargo carrier. Inside there’s 62.7 cu. ft. of carrying space with the standard 60:40 split rear seatbacks lowered, which is more than most full-size sedans and some small SUVs. Pre-Collision System with Pedestrian Detection (PCS w/ PD), Lane Departure Alert with Steering Assist (LDA w/ SA), Automatic High Beams (AHB), and Full-Speed Range Dynamic Radar Cruise Control (DRCC). All models have been updated with piano black accents around the shifter, on the steering wheel, and on the center console cover plus two additional 2.1 USB ports, an enlarged Qi wireless phone-charging tray to accommodate larger phones, and a standard heated steering wheel on XLE, XLE AWD-eand Limited models. There also are two new colors for 2019: Supersonic Red and Electric Storm Blue. The 2019 Prius AWD-e is expected to come in around the same as the 2019 Toyota Camry Hybrid‘s starting MSRP of $28,150. The FWD 2019 Prius has manufacturer-projected fuel economy estimates of 58 mpg city / 53 mpg highway / 56 mpg combined on the L Eco grade, while the LE, XLE and Limited have projected fuel economy ratings of 54 mpg city / 50 mpg highway / 52 mpg combined. The base front-wheel-drive L Eco trim starts under $25,000. AWD LE and XLE models will run closer to $30,000. All-wheel drive is not offered for the Limited trim, which is priced just over $33,000. For comparison, the 2019 Prius C, a hatchback, starts at $21,530. The 2019 Honda Insight LX starts at $22,930. The 2019 Nissan Leaf S starts at $29,990. The 2019 Prius comes with Toyota’s 36-month/36,000 mile basic new-vehicle warranty, which applies to all components other than normal wear and maintenance items. A 60-month warranty covers the powertrain for 60,000 miles and against corrosion with no mileage limitation. The hybrid-related components, including the HV battery, battery control module, hybrid control module and inverter with converter, are covered for 96 months/100,000 miles. Also on the horizon at the 2019 Nightshade editions of the Camry and Highlander. The Camry will sport black 18-inch wheels, a black spoiler, black window molding, black mirror caps, a black shark fin, black door handles, and black exterior Toyota emblems. It will comes in Midnight Black Metallic, Celestial Silver, and Super White. The Highlander follows suit with 19-inch black wheels, black lug nuts, and black headlights and fog lamps. The Highlander drops this month in a limited run of 5,000 available in Midnight Black Metallic, Predawn Gray Mica, Salsa Red Pearl, and Blizzard Pearl. The 4Runner Nightshade, available in Midnight black Metallic, Magnetic Gray Metallic and Blizzard Pearl, is out now. 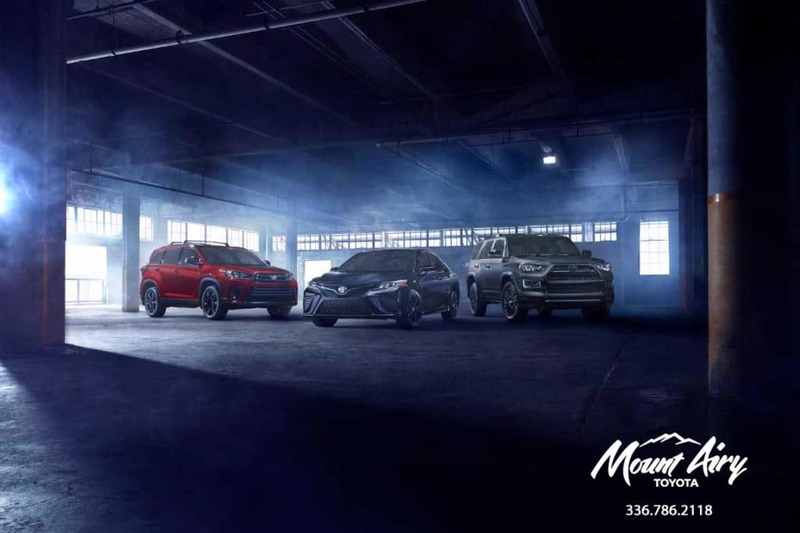 Don’t forget to check out our new vehicle specials available at Mount Airy Toyota, as we are still clearing 2018 stock to welcome these new 2019 models to the lot. You’ll also find great deals in our pre-owned inventory that includes certified Toyotas and other manufacturer trade-ins. We can work with you to value your trade and get you behind the wheel of something new. We invite you to explore our offers and incentives, learn more about our military and college grad. rebates, and schedule a test-drive. 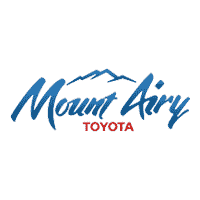 Come visit Mount Airy Toyota at 508 N. Andy Griffith Parkway in Mount Airy, NC. We’re open from 9 a.m. to 8 p.m. Monday through Saturday. You can always find us online at mountairytoyota.com or give us a call at 336.786.2118.